Home » VectorVest » Buy Cambian Group #CMBN says VectorVest. The commercial backdrop offers considerable investment potential. Buy Cambian Group #CMBN says VectorVest. The commercial backdrop offers considerable investment potential. By Alan Green in VectorVest on 21st February 2018 . Cambian Group (CMBN.L) is one of the UK’s leading children’s specialist education and behavioural health service providers. Founded in 2004, it has grown to become a significant partner to the UK public sector. The Group’s services have a specific focus on children who present high severity needs with challenging behaviours and complex care requirements. CMBN looks after 2,000 children and employs over 4,300 people across a portfolio of 224 residential facilities, specialist schools and fostering offices located in England and Wales. The solid earnings growth and strong cash position had been identified by VectorVest stock analysis metrics as far back as November 2017 when the share was revalued upwards. At present the stock continues to score highly across all key VectorVest metrics. The GRT (Earnings Growth Rate) metric logs a forecasted GRT of 27%, which VectorVest considers to be excellent. Added to this, CMBN scores an excellent RT (Relative Timing) rating of 1.43, (scale of 0.00 to 2.00). VectorVest now values CMBN at 239p, marking the stock out as undervalued at the current 198p. 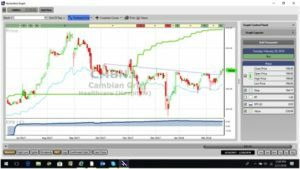 However the safety of the Earnings as measured by the VectorVest metric RS is low which means the opportunity in Cambian is only suitable for those investors who can manage risk and understand position sizing techniques. 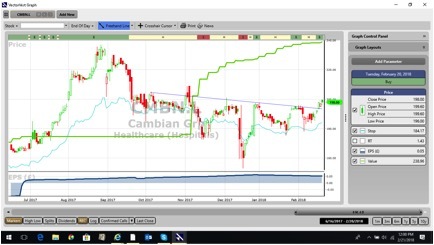 The chart of CMBN is shown above where the green line study plots the VectorVest valuation of the share which has risen strongly over the past 6 months. Technically the share has broken upwards from an inverted “head and shoulders” pattern which is a bullish sign. The technical target from the reversal “head and shoulders” pattern is similar to the VectorVest valuation. Summary: An investment into CMBN also provides investors with an opportunity to invest into children’s specialist education and behavioural health – a worthwhile endeavour by any standards. Added to this, the CMBN board demonstrate prudent financial management, which in the words of the CEO offer “medium and long-term value creation opportunities. As such, VectorVest believes the commercial backdrop offers investors considerable investment potential. Buy. Readers can examine trading opportunities on CMBN and a host of other similar stocks for a single payment of £5.95. This gives access to the VectorVest Risk Free 30-day trial, where members enjoy unlimited access to VectorVest UK & U.S., plus VectorVest University for on-demand strategies and training. Link here to view.